Landau Eugene Murphy Jr., the landslide winner of NBC’s hit television show America’s Got Talent, will perform his first ever concert in the Commonwealth of Virginia Friday March 23rd at the Roanoke Performing Arts Center. As a special treat for his fans that have lobbied for his appearance in Roanoke, Murphy is teaming up with the American Red Cross to offer a special “Red Cross Behind The Red Velvet Rope” experience for his March 23rd concert. Each fan who donates a pint of blood to the Red Cross in the Roanoke/Lynchburg area at designated blood drives between now and March 23rd will receive a special pass for Landau’s concert, which (with the purchase of a concert ticket) gives the bearer access to an exclusive backstage Red Cross Reception with Landau, including a photo with the America’s Got Talent winner, an autographed picture of Landau and other special bonuses. A list of blood drive donation locations is available at http://www.redcrossblood.org/appalachian. Tickets for the concert are on sale now at http://www.hometownbanktix.com or by calling 1-877-HTB-TIXNow. Murphy and his 16 piece Sweet Lippz Big Band has been performing to sell out audiences and standing ovations since winning the America’s Got Talent crown. The tour is in support of Landau’s Sony/Columbia Records debut CD release “That’s Life”. The album, produced by Grammy winner Steve Tyrell, features Landau’s unique and timeless take on classics from the Great American Songbook. It debuted at #1 on both the Billboard and Amazon Jazz charts. The former car washer and father of five from Logan West Virginia captured America’s heart with his music, his humble, gracious nature and his message to dream big and never give up. Over 14 million people each week watched and voted as Landau climbed to the top on America’s Got Talent on national television. Since his million dollar win, Murphy has headlined at Caesars Palace in Las Vegas, been nominated for “Outstanding New Artist” at the NAACP’s Image Awards, received The West Virginian of the Year award, been booked to appear at the legendary Apollo Theatre in New York next month and has honored his country by performing the National Anthem for ESPN at Madison Square Garden and prior to nationally televised WVU football and Marshall University basketball games. Known for his assistance to numerous charitable causes along his tour route, ranging from homeless shelters to children’s hospitals, Landau has also designated a portion of the March 23rd concert to benefit the local Roanoke Chapter of the American Red Cross, in addition to assisting with the blood drive. 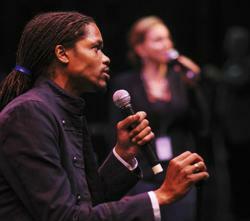 Landau Eugene Murphy Jr. is being presented in Roanoke by Marquee Live. Contact Rebecca Fuentes at rebecca(at)allenmediastrategies(dot)com or (703) 589-8960 for media or booking.